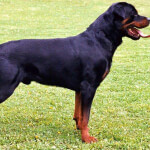 Rottweilers are a large dog breed which were originally bred to help drive cattle and pull carts. The breed's physical strength and fearless attitude makes them ideal guard dogs and watch dogs for the military, businesses, and families. 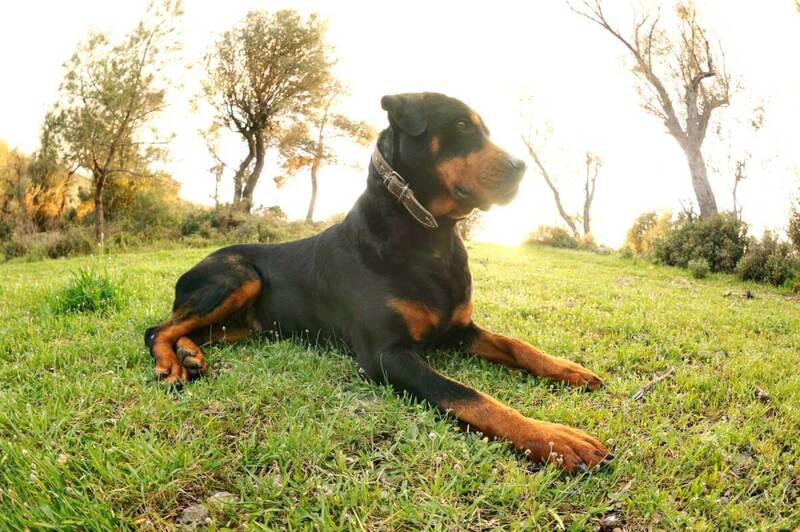 Rotties have a very strong protective instinct which can make the breed tricky for those not accustomed to this behavior. 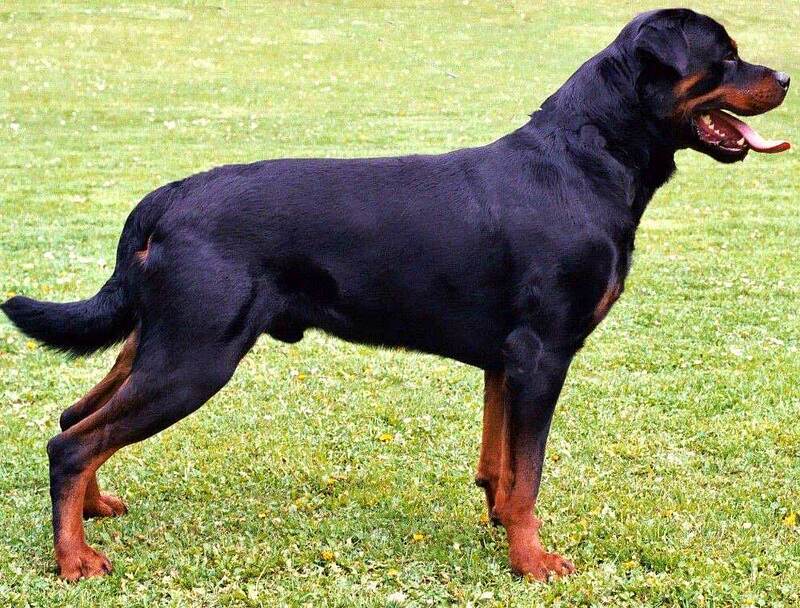 It is important to fully train and socialize rottweilers at a young age so their overly protective instinct doesn't lead to aggression issues in adulthood. 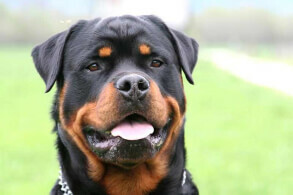 With this in mind, rottweilers are not an overly aggressive bully breed by nature. 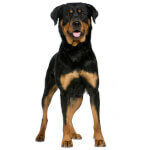 Well bred and properly socialized rotties are generally playful, friendly, and loving dogs. 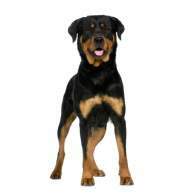 Below are the details and characteristics of the rottweiler dog breed. 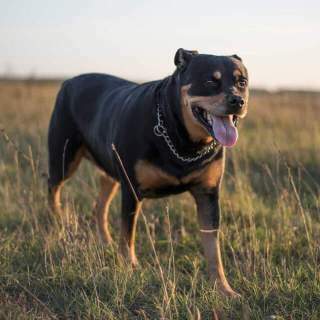 Rottweilers are considered a large to giant dog breed with males weighing as much as 130 pounds and being as tall as 27 inches from ground to shoulder. They are heavily muscled and strong which makes them ideal for pulling carts and intimidating potential intruders. The breed is confident and calm. They are suspicious of new people and unexpected situations and likes to observe people before deciding to make friends. Rotties are smart and have a very strong protective instinct, although they should never become aggressive without probable cause. The breed can be stubborn, but are easy to train using the right methods including positive reinforcement. Rottweilers are good with children, especially those who they were raised with, but need to be supervised since the dog's size can easily knock over a small child. The breed gets along with pets they were raised with, but can be wary towards stranger dogs. Rottweiler's coats are fairly easy to maintain. Their coat requires a weekly brushing and will need to be bathed as needed to keep their coat clean and odor free. They are people dogs and need to live with their owners (not away from them alone). Not all rotts have the same energy level. Some rotties are lazy couch potatoes, while other are very energetic. 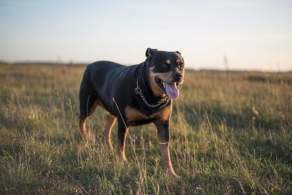 Mid energy rottweilers will need two medium length walks per day to meet their exercise requirements to prevent hyperactivity and destructive behavior. Below are the standard coat colors for the Rottweiler dog breed. Below are pictures of the Rottweiler dog breed.